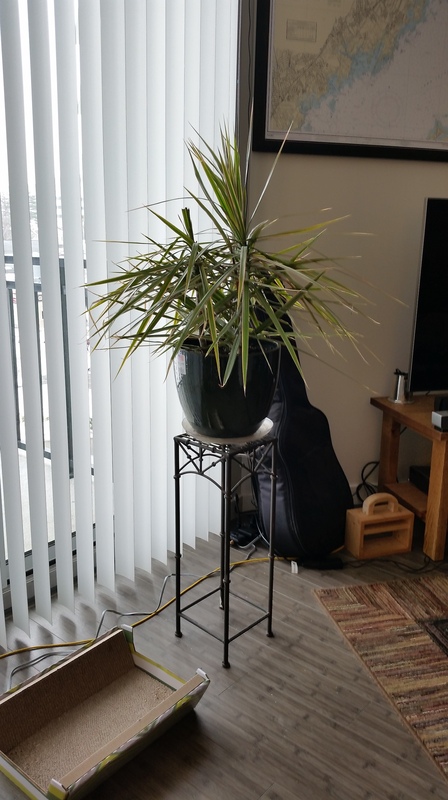 I have been pouring over potential plant stand designs for several weeks and I finally settled on what I think will work. The final height of the pot should end up roughly the same as the temporary fix (see below), which has been a useful guide. I haven’t nearly finished the build yet, but some of the stock (scrap hard maple) is at least surfaced and ready for final dimensioning and joinery. In my continued quest to not turn The Apartment Woodworker into a “look at this awesome thing that I made with my awesome tools” kind of website, I would like merely to share the design specs and explain some of the choices. I am certain the design will be refined further through the build process, but for now, I am satisfied with the aesthetic baseline. Careful readers will note the ratio of each leg above and below the cross-member is almost exactly that of a lightsaber (or, if you’re boring, a katana). First, the piece only has three legs. While there has been much going on lately in the world of three-legged furniture, I really just wanted some practice cutting angled tenons and chopping angled mortises. Much of what I design and build is square and true, which can get pretty boring. Plus, the splay and the angle of the legs will keep it stable and the tops of the legs will secure the pot laterally. Second, the hub design was born from how to get the correct splay angle on the legs. I initially gravitated toward a lapped t-shape (seen top right), which would have reduced the number of individual pieces but required a compound angle on each tenon. 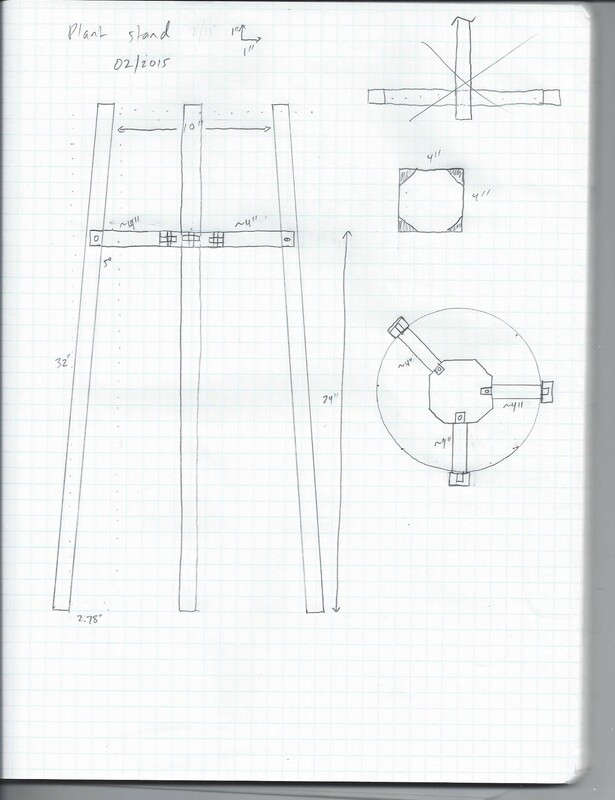 Unfortunately, the piece will be weight-bearing, and that compound angle would not place the load on the legs parallel with the mortise and tenon. The hub design, though, allows for the in-line load distribution. I can drawbore each leg assembly to the hub for an eternal joint, even with the additional complexity. Finally, although the drawing doesn’t show it, I will probably shape the legs a bit as an excuse to put my new spokeshave (a very old Stanley with a very new blade) through it’s paces. In case you are wondering, this is my current, temporary solution. River ate the crown off the left stem, which was the impetus for this particular project. Now I just have to build the thing. I’ll post pictures when it’s finished.